REGISTRATION: 5:30am Russell Strong Auditorium, PA Hospital. 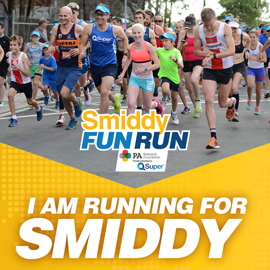 We encourage all fitness levels to take part in this fun run! We welcome families, children, strollers, prams and dogs (as long as they are kept on a short lead; the dogs that is, not the children). The 2.km Walk consists of one single lap of the course. This course is suitable for ages 15/u with a guardian. 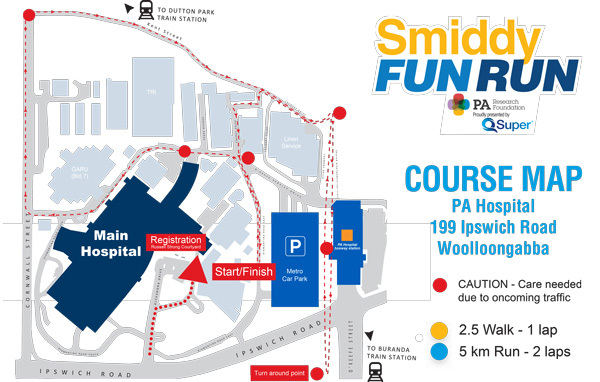 The 5km Run consists of two laps of the course. There will be a lead bike to keep pace with the runners. This course is suitable for ages 16 years and over only. 6:00 start. Please ensure you register on your arrival. Upon checking in or registering for your event on the day, you will receive a race wristband. After the run breakfast is provided and prizes will be presented. Please ensure you register on your arrival for the run. Registrations will be open from 5:30am in the Russell Strong Auditorium. Bag storage is available. The Russell Strong Auditorium is located beneath the hospital. Follow the signs from the main foyer down the stairs near the staff cafe. Or from Ipswich Road follow the path around to the right of the hospital. Your entry includes a healthy breakfast of all you can eat fruit, museli, yoghurt, rolls and juice with Tea and Coffee donated by Starbucks. What’s there on the day? As well as the Registration and Breakfast areas, you can find information on our sponsors and supporters. Toilets are located inside in the foyer of the Russel Strong Auditorium. Showers for PA staff are located in their respective departments. There are showers for the public available in the Staff Gym which is located in Building 61 (see map). There are 4 showers available – one in the Male Change Room, one in the Female Change Room (includes a hair dryer and straightener) and two located in the accessible bathrooms. Directions: Go to Building 61 (see map). Entrance is located at Trade Avenue – there is a sign with the word Trade, doors will be open and the Change Rooms are located at the end of the corridor. There will be plenty of signage and volunteers on the day to help with directions. The Metro multi-story car park is located on city side of the hospital, on the corner of Ipswich Road and O'Keefe Street. There is a link-way into the main foyer of the hospital then follow the signs to the courtyard. The P.A. Parking multi-storey car park is located opposite the main hospital building on Ipswich road (entry off Wolseley Street). There is a link-way over Ipswich Road and follow the signs to the right of the main building to the courtyard. Brisbane City Council street restrictions apply in all streets surrounding the hospital - 2 hour parking fees apply from 7am. There are a number of options for travelling to the Princess Alexandra Hospital by bus: The PA Hospital Busway station is located on the hospital campus. There is a walkway leading directly from the station to the main foyer. Regular bus routes through the PA Hospital Busway station include: 109 (City), 169 (Eight Mile Plains), 139 (Sunnybank Hills) and 209 (Carindale). Ipswich Road is a major bus route with frequent bus transport during the day. There are bus stops outside the hospital on Ipswich Road and Cornwall Street. The Buranda Busway station is also a ten-minute walk from PAH. It also provides services to and from the city centre and southern suburbs. The nearest railways stations to Princess Alexandra Hospital are Dutton Park (Beenleigh line) and Buranda (Cleveland line).